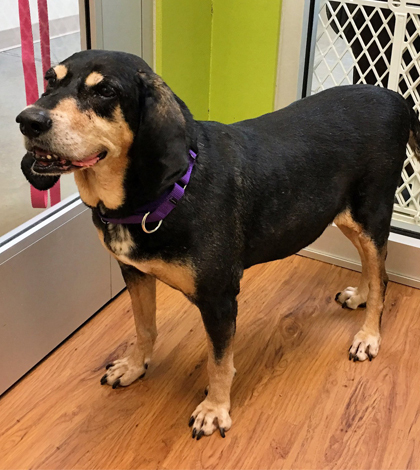 Gracie is a seven-year-old coonhound mix who is more of a Netflix binger on the couch than a hit-the-club-type of girl. She spends most of her days snuggled up on her bed and taking her ear rubs as they’re given. Gracie gets along well with other dogs and fills the role of momma dog who isn’t afraid to keep her misbehaving 4-legged foster siblings in line. Gracie is fully house broken and tells you boisterously when she has to go out. Gracie is looking for an easy going companion who isn’t looking to take her on rigorous adventures. Gracie is living in a foster home. Contact Helping Strays at 618-939-7389 to make an appointment to meet Gracie her, or visit http://helpingstrays.org/pets/2018249c/gracie.